I guess their 5-1-0 start isn't really fooling anyone! There's still plenty of time left in this poll, but so far the pessimistic view of the Golden Knights is quite overwhelming. Only 7% of respondents feel that they're a possible playoff team, despite starting off with a 10-point head start in the first six games. I suppose the pessimism is well-founded. They are an expansion team after all, and they're schedule includes two wins over Arizona, one over Buffalo, and one over a Bergeron-less Bruins team. Their special teams have been atrocious, ranking 27th on the power play and 18th on the penalty kill. Their shot-based metrics are middling at best. And, it's hard to imagine a team with a top pair of Nate Schmidt and Luca Sbisa, and a second pair of Deryk Engelland and Jason Garrison (or Brad Hunt) as any kind of contender. But, we shall see. I'm normally not one to get involved in philosophical debates, but Matt Henderson made an interesting point that I chose to retweet. "Eyeballs vs Analytics is only a thing for people who don't want to learn about analytics. It's eyeballs AND analytics for everyone else." Matt doesn't presume that there is anything fundamentally unreasonable about using your eyeballs. In my view, there's nothing unreasonable about that perspective. Analytics aren't for everyone, the same way not everyone cares about training techniques, or equipment, a player's personal life, or any other number of areas that can have an impact on the game. While there are people who use their eyeballs and nothing else, Matt is correctly pointing out that nobody does the opposite. That is, nobody uses analytics and nothing else. The choice is between using your eyeballs, or using your eyeballs plus analytics. It's not eyeballs vs analytics, it's eyeballs vs eyeballs plus analytics. Sure, some people use more analytics than they do eyeballs, but nobody uses analytics all alone. Interestingly, the assumption that you have to choose between eyeballs and analytics is a phenomenon exclusive to analytics. If I wrote about all the latest equipment, nobody would tell me to just watch the game. That is, nobody would assume that I was looking at a player's skates and sticks exclusively, and not the game itself. Same thing for training techniques, a player's personal life, or anything else. Analytics is the only facet of the game where people presume that someone would study it to the exclusion of anything else. While on the topic of those who like analytics, RITHAC is this weekend, which is the third annual Rochester hockey analytics conference. For me, it is very rewarding to see these conferences take off, since I held the first one just over three years ago. On one hand, it is wonderful to see these conferences prosper on their own, without me. There are so many other things that have yet to fully catch on, like writing hockey books, helping people get front office positions, getting more people on TV and radio, and so on. So, it's great when something does catch on, and fly without me. But, of course, it can be bittersweet to see a bird leave the nest. This is only the second conference for which I wasn't invited (the second annual Vancouver conference was the first). I'm not needed anymore! That's a great thing in most respects, but it's also sad when I'm not needed anymore. You know, I doubt that the Ottawa conference needs me anymore either, but it's nice that they always ask me to come anyway. If I was in attendance, I'd be eager to hear more about the following presentation by one of the newest stars in the analytics scene, Namita (@nnstats). 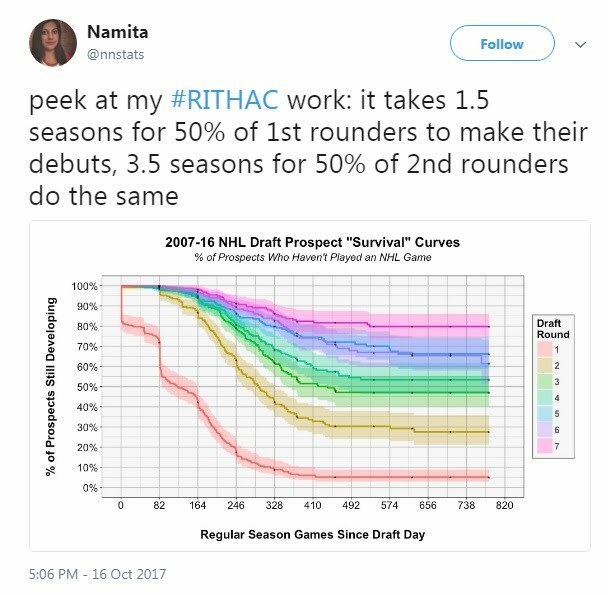 She tweeted a sneak peek of her study, in which she discovered that it takes 1.5 seasons for 50% of first-round picks to make their NHL debuts, but 3.5 seasons for 50% of second-round picks to do the same. It would be interesting to integrate some of these ideas into my team-building model. Last team to score a power play goal this season? Overwhelmingly, we thought it would be Montreal, but it turned out to be Anaheim, who was the most unexpected results. Surprisingly, the most common answer was Claude Giroux, followed by the more sensible (and probably wiser) choices of Sidney Crosby, Alex Ovechkin, Steven Stamkos, and Drew Doughty. Well, let's repeat the exercise today. First, I asked the question in an open-ended way, to see what the most common answers were. Then, I grabbed the four most common ones and put them into a poll. The results were overwhelmingly in Auston Matthews favour. (Note: I obviously had to remove the obvious answer McDavid from consideration). Are we correct, or will Matthews be the future Giroux? Some of it might depend on how much he signs for. If it's much higher than the $10M/yr they're giving Eichel, then I'm not sure that he's the right selection. But, time will tell -- we'll re-visit this in seven years!